Over the last year, Life Saving Victoria (LSV) reported a total of 107 drowning incidents (including both fatal and non-fatal) across Victorian coastal and inland waterways. The most shocking fact of all this is that over the latest summer LSV reported 23 drowning fatalities, the highest summer drowning toll for Victoria in 20 years. There appears to be worrying trend within Victorian coastal waterways with a 28% increase in drownings over the last year compared to the 10-year average from 2007/2008 to 2016/2017. Simply put, it means the widespread water safety messages are not being heeded by the Victorian community and people are continuing to put their lives at risk when playing in the water. 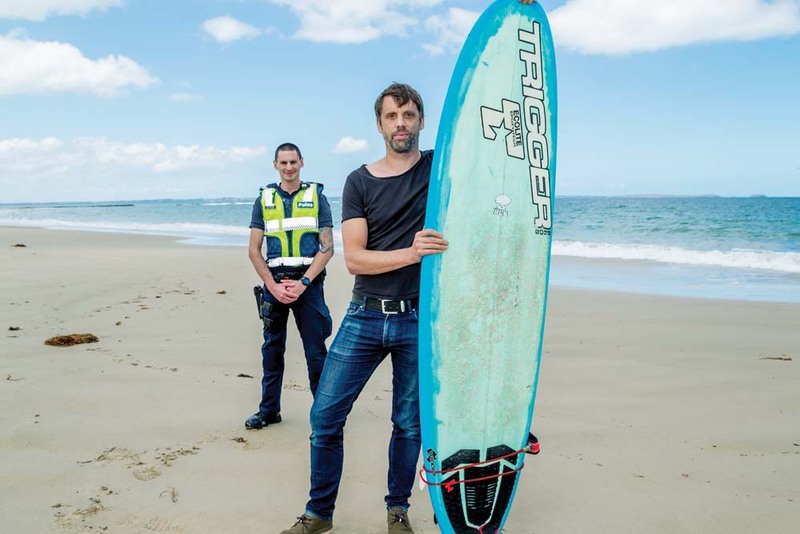 Surfing Victoria (SV) in conjunction with Play It Safe By The Water are instituting a program across the state with aim to combat the rising toll of drownings in the surf. The Surfers Rescue 24/7 program is a free initiative designed to educate surfers and the like on how to spot people in trouble in the surf, perform board rescues and administer basic CPR while waiting for further help arrive. Surfing Victoria is calling on all surfers to undertake the free sessions delivered throughout the state as they might be the difference between preventing a drowning and saving someone’s life. As such, SV are also asking surfers to report and share any stories of when they have either performed or been involved in a rescue when out in the surf. One such example was Kieran Kellett from the Mornington Peninsula who in September 2018 was one of the first on scene when he successfully performed a rescue in the surf on an unpatrolled section of the beach in Point Leo. We recently interviewed Kieran to ask him about his experience and his advice for those when entering the surf and performing a rescue. SV: So how long have you been surfing for Kieran? KK: I started surfing when I was about 16-17 years old and I’m now in my early 40’s so I have approx. 20+ years experience in numerous conditions. SV: You definitely know how to handle yourself in the surf then. Back in September 2018 you performed the rescue of a young girl who appeared to be drowning in the surf on an unpatrolled section of beach in Point Leo, can you describe what happened that day? KK: Yeah, it was quite an emotional experience but certainly one I’ll never forget… I was getting ready for a surf that afternoon when I noticed a Police car rush past me with lights and sirens on the Frankston-Flinders Road towards Point Leo Road. Not thinking too much of it I made my way down to the Crunchie Point lookout where I saw the Airwing hovering above the surf. I moved on to the Surf Life Saving car park where I found a Police car and an Ambulance in attendance. I was hoping to surf the break known as “First Reef”, but noticed someone clinging on to a mal (longboard) about 200-300m offshore. SV: What did you think upon seeing that? KK: Well they looked to be in real trouble as they didn’t appear to be moving at all and I thought to myself if they come off, they’re probably going to drown. SV: What did you do then? KK: Acting on instinct I grabbed my board and made it down to the beach where a couple of Police officers and Paramedics where standing by along with another gentlemen who appeared to be really exhausted. I informed the Police officers I was a local surfer and asked whether they would like me to paddle out to help the person still stranded on the board. SV: What did they did they tell you? KK: They informed me that they weren’t going to stop me from going in, but I might be risking myself by going out there. However, I just kept thinking to myself if the person goes under they’re going to drown for sure. SV: Can you remember what the conditions were like out there at the time? KK: Yeah, the conditions were perfect light offshore 3ft+ waves with a possible strong undercurrent, nothing that would trouble a more experienced surfer, but for those inexperienced and unfamiliar with the area, it would have been dangerous. SV: So you paddled out, what happened next? KK: Once I made it out, I found a young girl clinging to the mal and initially she was motionless, but once I was able to talk to her, she managed to respond and was just extremely exhausted. SV: On your initial assessment, what do you believe had happened? KK: There was certainly some rip currents present, so I believe she had been caught in one, then trying to swim against it she was probably taken out the back of the wave set. I later found out that she had been in the water for over 40 minutes in her current state which explained her exhaustion. SV: We’re certainly aware of how dangerous rip currents can be. In this instance, it appears the young woman had been dragged out quite a long way and was in no shape to make it back in on her own. What were you thinking at this moment and given the situation, what steps did you take next? KK: My first thought was to stay with her, reassure her and keep her calm. She was unable to move as she was so exhausted so if she came off her board she was a real chance to drown. I had to point her board in the direction of the shore and from there, I slowly pushed her in toward the safety of the beach whilst making sure that I didn’t make any sudden movements that may cause her to fall in the water. My biggest concern was that she would be unable to help herself stay afloat and would take on water if she came off the board. Once we were close enough to shore, the emergency services on the beach came to her aide and she was treated for hypothermia. She was joined by the gentleman on the beach I mentioned who I later found out to be her friend. SV: Was he the one who had alerted the emergency services? KK: I believe so, he too had been caught in the surf and had somehow made it in to shore despite being exhausted as well. SV: What was the follow up to the incident? KK: The girl made a full recovery after being transported to the Frankston Hospital with her friend. However, I was chatting with a surfboard shaper from Trigger Bros. Surfboards (local surf retailer) a few days after the incident and he informed me that he knew of the female and male that I spoke about. He said he was coming out of the surf that evening when he encountered them going in. He’d noticed they were novice surfers and warned them not to surf in the conditions at that break and advised them to move down the beach closer to safer conditions. SV: Its really surprising that they still entered the water even after being advised by a local that it could be risky. I think the young woman was extremely lucky that you turned up that evening. Did she eventually get in touch with you? KK: Yes she did through an intermediary and was immensely thankful and grateful for rescuing her that day. SV: Have you ever completed a rescue in the ocean before? KK: Yes I was involved in a rescue of another woman while swimming on a beach in Maroochydore, Queensland a while back. She had been doing the right thing and swimming between the flags, but had somehow drifted out in the current. When I made my way to her she was in about 6ft of water and was getting hit with 2ft waves. She had become distressed and was falling underneath the water. Again in this instance, I made sure to keep her calm and reassured. From there, I signaled to the Surf Life Rescue team on the beach that she was in trouble. I stayed with her until they reached us and safely pulled her into shore. SV: You seem to have a knack for being in the right place at the right time Kieran. KK: Ha ha, yes I guess so. SV: How important do you think it is for people to know their limits before entering the water? KK: Well I know when I first started surfing, I took some unnecessary risks that looking back on now I really shouldn’t have. I think now I’ve seen firsthand what can happen when it goes wrong, that its extremely important to know your limits as a swimmer and a surfer and more importantly your limits in the surf. Being aware and able to identify rip currents and dangerous conditions is an absolute must and I believe those less experienced should always go surfing with more experienced surfers who’ll be able to assess conditions for you. SV: Are there any advice or tips you would give to people who may have to perform a rescue in the future? KK: Definitely have a knowledge of CPR and basic First Aid. As mentioned, definitely know your own strengths when attempting to perform a rescue as you don’t want to encounter trouble yourself. Finally, keep calm and composed for those you are trying to help as it will reassure them, keep them calm and make them feel safe. KK: I have completed a basic First Aid. SV: Well Kieran, thank you so much for giving up your time and speaking to us about your experience having performed a rescue in the surf. You certainly should be commended for taking action and remaining calm under pressure in such a serious situation. Its hoped that we can use your example to encourage others like you to take advantage of our free Surfers Rescue 24/7 program and help spread the message of safety when playing in the water. All the very best for the future. KK: Thank you very much and that’s not a problem.